We enjoyed one of those days that make the Wine Club all worthwhile. The 2006 Clos des Chenes premier cru De Lagranges Burgundy and the 2006 Domaine Montrachet premier cru Puligny-Montrachet vanished shortly after they were opened. There was a little Chandon California brut classic left, but what can you expect? Fortunately for those who were there, quite a few members were absent. Next week, those who were absent can return to enjoy our usual vin ordinaire. We auctioned off a couple of stuffed bull dogs. Gordon is the proud owner, and the club foundation is $35 richer. August 19 is the annual Half Marathon. Once again, we need volunteers to show up at 7:00 am and pass out water to contestants. If you can help out, contact Nancy Stoke at nancystoke@earthlink.net. Thanks in advance. Our speaker was Halle Razak of the San Diego County Water Authority. 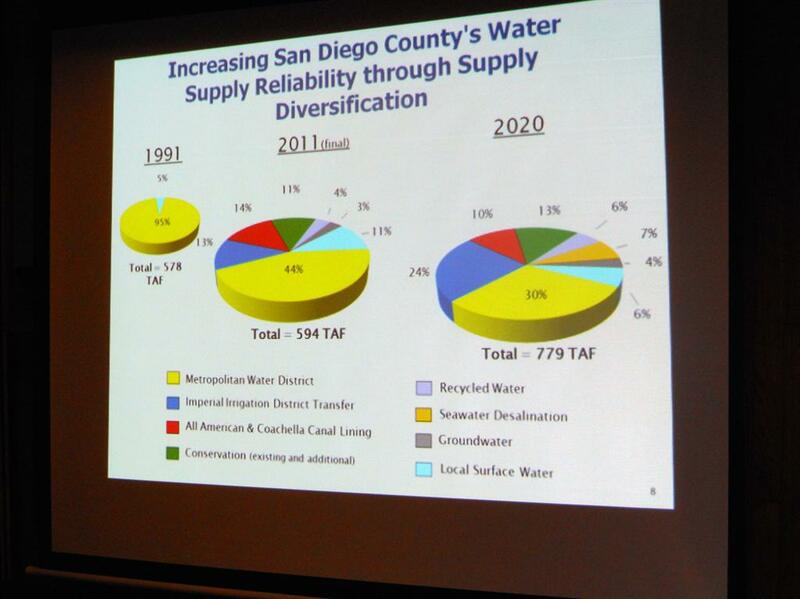 She went over the changes in water usage San Diego has experienced over the last 2 decades and reviewed the ways in which the Water Authority builds, maintains, and operates San Diego’s water infrastructure. She also discussed the law suit that the Water Authority has pending against the regional Metropolitan Water District. Following the meeting, we held the first of Jerry’s board meetings. The next board meeting will be in August.